Iran’s interior minister has emphasized the necessity for countering terrorism in the Middle East, saying the Islamic Republic considers Iraq’s security its own. Abdolreza Rahmani Fazli made the remarks at a joint press conference with Iraqi Interior Minister Mohammed Salem al-Ghabban following their meeting in Tehran on Saturday. Supporting the Iraqi nation and government is among “our religious, neighborly and national obligations,” Rahmani Fazli said. 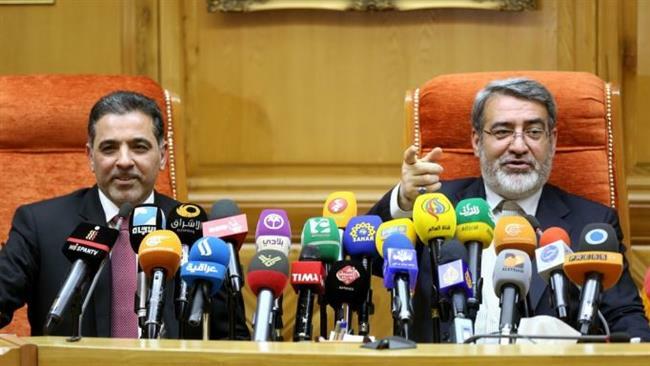 The Iranian interior minister said that during his meeting with Ghabban, both sides discussed the issues of mutual interests, including security cooperation. Rahmani Fazli further expressed the Islamic Republic’s full preparedness to share security, military and training expertise with Iraq. Ghabban, for his part, commended the Islamic Republic’s support for Iraq in its anti-terror fight, saying Iraq is willing to use Iran’s experience in different domains in line with the mutual interests of the two countries. Iran has repeatedly stressed that it will not interfere militarily in Iraq and Syria, but the Islamic Republic continues to provide support to both countries against the ISIL Takfiri terrorists in the form of defense consultancy and humanitarian aid. At the onset of the ISIL advances in Iraq, the Islamic Republic took rapid steps toward mobilizing popular forces in the country. Tehran has also refused to join the so-called US-led coalition against ISIL in Iraq and Syria.